The A42 Acrylic Patio Dining Table is an undisputed classic. The round, 42" tabletop can comfortably seat up to 4. The acrylic has a beautiful, hammered finish that is shatter and sun resistant. The base of the A42 Acrylic Patio Dining Table is crafted from 1" round extruded aluminum tubing. 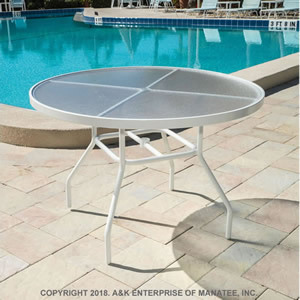 This patio table can be customized to fit your needs - order it in any frame finish and with or without an umbrella hole. Create your own outdoor furniture set when you pair this commercial outdoor table with any dining chair. Design yours and request a quote today!